Medically speaking, the jaw joint is known as the temporo-mandibular joint (TMJ) and it’s located just in front of your ear. The TMJ is important because it acts as a hinge that allows your lower jaw to move when you eat or speak. 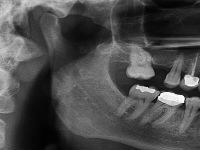 In between the bones of the jaw joint is a small piece of cartilage that acts as a buffer between the bones, and this can easily become damaged as the result of trauma or over-stretching (such as a very wide yawn). As a result, the joint or the muscles around the jaw can become painful, or jaw function can become restricted. A painful jaw joint is a common condition, but it can be very difficult to treat. During your consultation, Dr Cosson will conduct a clinical examination of the joint and your x-rays to ensure there are no diseases around the bones or your teeth that may be causing the painful condition.